You can CLICK on ANY PHOTO above to see it Full Size WIDESCREEN glory. Use the side arrows to scroll through the photo gallery. You can ALSO see this diorama in FULL HD VIEW, Simply CLICK HERE to warp to that gallery page. 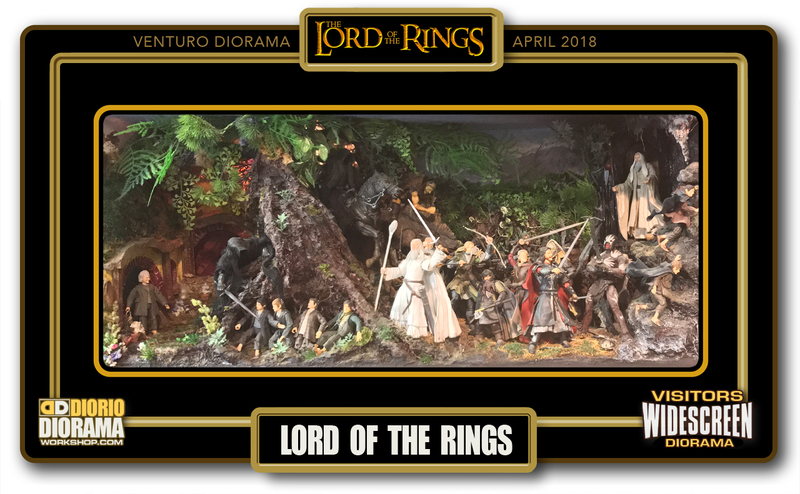 I had bought all of the Lord of the Rings figures way way back when the movies came out and since gave them away to get rid of house clutter, yes, sometimes regret, and never got around to doing a diorama. The figures were great and in an environment like this stand out even better. This is just too cool. Thanks for sharing Jack. Did you also build a Diorama ? Would you like to show it in the site’s GALLERY VISITORS DIORAMAS section, yes ? THAT IS AWESOME !!! You can find out all the details on how to email me your photos on the VISITORS SUBMISSIONS INFO page … When I get your photos, I will create your very own page just like this one. You may not realize it but work does inspire others to join in the fun of making Action Figure Dioramas.